What Does Code P0090 Mean? Diesel engines and gasoline direct injection (GDI) engines have something in common: They inject fuel directly into the cylinder on compression. To make this possible, both systems utilize two fuel pumps. 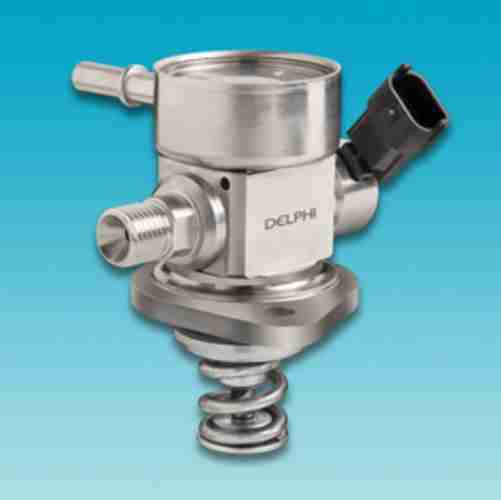 A supply pump, mounted in or near the fuel tank, supplies fuel to the secondary pump and, in the case of GDI engines, the port fuel injectors. This primary pressure usually maxes out around 75 psi. The secondary mechanical fuel pump, mounted on the engine, bumps that pressure many times higher, GDI engines up to 2,500 psi and diesel engines over 4,000 psi. 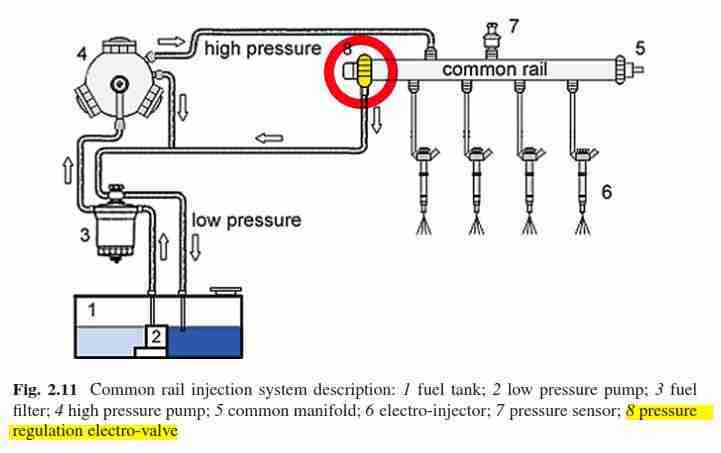 This high fuel pressure is necessary, to overcome cylinder pressures, as direct injections systems need to inject fuel on the compression stroke, unlike low-pressure port fuel injection systems, which injects fuel into a partial vacuum. At the same time, such high fuel pressures can be inherently dangerous and destructive, which makes fuel pressure regulation critical. Within specifications, high fuel pressure is necessary and expected. Low fuel pressure would result in poor engine performance and fuel economy. On the other hand, a spike in fuel pressure could actually damage the system. 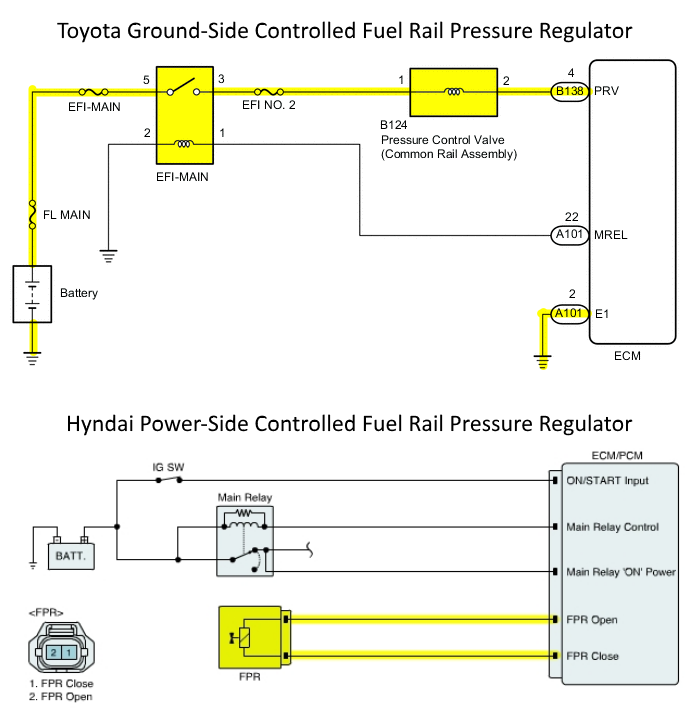 The engine control module (ECM) controls fuel rail pressure (FRP) by modulating the FRP regulator, using feedback from the FRP sensor. If the ECM detects a problem in the FRP regulator circuit, it will set a DTC (diagnostic trouble code), P0090 Fuel Rail Pressure (FRP) Regulator Control Circuit Malfunction, and illuminate the MIL (malfunction indicator lamp). Note: Open Circuit means that a component or sensor in a system is deprived of the reference voltage it needs to work. Causes of open circuits are many and varied, but for the most part, this type of code is caused by broken wiring, poor connections across electrical connectors or previously repaired wiring, loss of ground that prevents current flow, blown fuses, defective relays, faulty switches, or any of a host of other issues and problems that prevents the flow of current through wiring. What are the common causes of code P0090 ? Depending on year, make, and model, DTC P0090 may have number of causes. Here are some of the most common. Wire Harness Problem – Poor repair practices, bad wire routing, or other wire harness damage can cause a failure in the FRP regulator circuit. FRP Regulator Problem – A faulty solenoid coil in the FRP regulator can cause this problem. What are the symptoms of code P0090 ? If the FRP regulator isn’t working properly, the ECM may be able to run GDI engines in low-pressure mode, while diesel engines may not run at all. You may experience hard starting, no starting, poor performance, poor fuel economy, rough idle, or cylinder misfire. Concurrent DTCs may be present, such as cylinder misfire or fuel trim codes. How do you troubleshoot code P0090 ? Because this DTC references a circuit problem, you can use a DVOM (digital volt-ohm meter) to diagnose this problem. You will need to focus your attention on the FRP regulator and the harness between the FRP regulator and the ECM. The FRP regulator may be mounted on the fuel rail or on the high-pressure pump. Wire Harness and Connector Check – Make sure the wire harness is free of damage. Make sure the FRP regulator connector is in good condition, no bent or backed-out pins, corrosion, or water entry, and is firmly seated. Repair as necessary. FRP Regulator Circuit Check – Disconnected the FRP regulator and check for resistance. Check the repair manual for proper resistance specifications. For example, a single-coil regulator may be controlled on the ground side by the ECM, while a dual-coil regulator may be controlled on the power side, with the ground in the regulator. If there is excessive coil resistance or a short to ground, replace the regulator.